Good picks I suppose. Only thing that made me raise a brow is that Mokou is described as often blunt. Am I? Sakuya as the closest match, Byakuren as the runner-up. I'd say my reasoning for both is similar to Leon = Helsing too, now that I think about how I've changed over the past several years. The following characters still haven't made an appearance! I actually took it yesterday but didn't post it. Now re-took get the image back, then a couple times more and pretty much always got Alice, even if I made some concessions. Sakuya was in there as well. I got Ichirin. I suppose that works for my general attitude, though I'd consider myself a bit more on the thinking side of things. Same here, which surprised me because Reisen wasn't one of my favorites. Are we related somehow? This is weird. Hello. Anyway, I'll probably take it again later and make comments on my choices which is something I thought about doing in the first place but didn't. Maaaaaybe. Is Genghis Khan in your background somewhere? I'm not asian, so no. Donald Trump will not make Waifus real. So i highly doubt there's any deep connection, we just have similar personalities. Regardless, I'd give myself SHISU. Alice and Mokou do feel more up my valley. I see. Well, glad it worked out for you. Yeah, I meant it. In a good way. Seriously, I saw myself in these lol. I'm nowhere proactive nor outgoing as Marisa is though, but apparently science seems to hold a different opinion so okay I guess. I think you meant to say "Do you feel that there is often something you contribute to the people around you?" Yeah, that needs to be reworded. Also the way I would answer it personally is strictly No, and someone with a different answer might ask the question a completely different way lol. Sakuya? Really? I took it as a bit of an insult but it makes sense. The questions themselves are kinda iffy, both in how they're phrased and the trait points the answers yield. If anyone is curious I can share that as well. Closest Match is Reisen, Runner-Up is Mokou. That's just a joke (though you could argue it's not a joke because it's not funny) and doesn't reflect my political views. Sure, also it would probably be a good idea to show what scores the taker got at the end of the quiz. 1. Do you often find yourself acquiring new tastes and passions through observing others? I picked 4 because it's the case with a lot of the things I end up doing. Even trying Touhou was something I did because of other people, though it's more because I wouldn't have known about it in the first place if it wasn't for other people. I don't really do something to be "trendy" either. 2. When you have opinions that don't align, how likely are you to change your own opinions to better match your friends'? The questions that relate to friends are more hypothetical since I don't really know anyone I would consider a friend. But I think I wouldn't change my opinion just because my friends would think differently. At least for opinions that are based on facts I picked 2 because I'd agree with them if they can convince me or show that my facts aren't entirely correct. 3. How quickly do you react to most jokes and innuendos? 4. Something supernatural is occurring in Gensokyo. Assuming you don't have anything to do with it, how are you most likely to get to know more about it? Watch the news. I mean 1. 5. Whenever you initiate conversation in any situation, is it more often that you have to, or that you just feel like talking to the person? Can I say both? Anyway I picked 1 because I'm not a very talkative person usually, though I sometimes pitch my thoughts in too. 6. When you get into petty arguments, are you more often frustrated with someone, or defending yourself against someone else's frustration with you? 3 because I try to avoid arguments. But if I am angry, I just shout then leave the room to calm down. 2. Everyone overhears things sometimes but I wouldn't try eavesdropping. Although I'm physically disabled so I don't think I would be running errands in the first place. Also, I'm not sure what "none of the above" would mean in this case. 8. What is your preferred wardrobe? What my mom makes me wear lol so probably 3. Also looking is also a job that clothes do. 9. Do some of your closest friends look to you for emotional support and let you in on deeply personal issues (in private)? Like I said before, I don't have any friends so 4. I actually don't remember if I picked 3 or 2 the first time. It's not very often, but sometimes I do make situational jokes or ask a question if someone is talking. I guess 2. 11. What is more important: getting along or getting things done? Think: working as part of a team. I think last time I picked 3 because if you're working in a team then you don't want to have arguments but you also need to get the thing done which could mean someone's opinion would have to be discarded. 12. What do you value most in a companion? I don't remember my last choice, but I think I picked 2. If your "friend" is judging you and your choices all the time I don't think they are a good friend. But there is a difference between judging and helping you make a good choice by speaking their mind. I didn't pick 1 or 3 because that sounds like I would be using or abusing my friends if I felt that way. I'm not so sure about 4 and 5 just sounds like I have no self-esteem. 13. 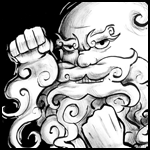 You are the strongest Yama in charge of judging the dead, and you can't back out of your job. What is your view regarding Naraka (deepest layer of "Buddhist Hell")? Note: souls that aren't sent to Naraka don't necessarily end up in Bhavaagra (Enlightened paradise). I just took this as "how do you feel about the death sentence?" so I picked 1. So I got the same result after retaking so I guess I picked the same options. I can't really say how accurate the descriptions of the characters are. As for how much I identify with the results, I don't think nanny-like would be a way to describe me. My brother is probably more like that. I'm not sure about how practical I am, but it's probably in the middle. I sometimes do things that aren't very practical. Besides that, I do think of myself as part of the more self-controlled half of my family, but even I sometimes lose my temper. As for the Meiling half I do procrastinate on "important" things even things I do actually like doing. As for "heroic" and "grandiose" I don't think those describe me well. Again, my brother is the one going on crusades all the time, especially if climate change is involved. Writing all of this took far longer that I expected it to. The questions that relate to friends are more hypothetical since I don't really know anyone I would consider a friend. (Glances briefly at own user name). Hm, yeah. This can happen to anyone, I suppose. Everyone overhears things sometimes but I wouldn't try eavesdropping. Although I'm physically disabled so I don't think I would be running errands in the first place. Also, I'm not sure what "none of the above" would mean in this case. I had to cover all bases. Someone's answer might be as specific as "complain to the group that you're allergic to people, then walk away." This question pertains to the isolationist-intervening spectrum, and I wouldn't exactly put asking questions on the intervening side. An intervening person is more of an initiator, while an isolationist person might not necessarily be quiet. Here I'm trying to get a number on the Harmonious vs Utilitarian scale. Though, this question was poorly asked. The Kant school of philosophy sees human beings as ends rather than means, and I was hoping that some people would see interpersonal bonds to be just as important, if not more, than getting a task done. Ok, I don't want to go too deep into modern politics, but I just want to point out the difference here. The Yama can see everyone's sins without fail, there's no escaping it, whereas the death sentence might seem unpalatable to some because of the slight possibility that the person is innocent. Man, sure feels nice to see this pet project evoke so much self-reflection in someone. Thanks for taking the effort to rehash your thought process! I think I'll do just as you suggested about showing the taker's scores, maybe give a few days. And since you asked for it, here's the questions and the point values of each answer. -Letters correspond to the personality category followed by a number (scale of 1-4). -Plus signs separate the point values if one answer yields points in multiple categories. -All the points in each category are averaged out in the end. 4. A lot of the time. 1. I'm slower than I should be. Something supernatural is occurring in Gensokyo. Assuming you don't have anything to do with it, how are you most likely to get to know more about it? 1. By having someone whose knowledge I trust piece it together for me. 3. By not giving it much thought at first if it doesn't directly affect me, but learning more as it starts to. 4. By consulting my prior experience, gut feelings and logic to deduce what caused the incident. Whenever you initiate conversation in any situation, is it more often that you have to, or that you just feel like talking to the person? 1. Most of the time, I have to. 2. Most of the time, I feel like it. When you get into petty arguments, are you more often frustrated with someone, or defending yourself against someone else's frustration with you? 1. More often frustrated with someone. 2. More often defending myself. 3. I don't know / I don't get into petty arguments. 1. Let your curiosity get the better of you and try to listen in without being noticed. 2. Ignore it and continue minding your own business. What is your preferred wardrobe? 1. Something that people are not likely to raise questions about. 2. Something that reflects my deepest aspirations. 3. Whatever's comfortable and does its job. Do some of your closest friends look to you for emotional support and let you in on deeply personal issues (in private)? 3. No, but I'm willing to bet they don't do this to anyone. 4. Most of the time. What do you value most in a companion? 1. I'd like them to be able to keep me interested / entertained. 2. I like people who won't judge me and my way of thinking. 3. I value friends who are helpful the most. 4. I don't know. If I could I would get along with just about anybody. 5. I'm just glad to have someone acknowledge my presence. You are the strongest Yama in charge of judging the dead, and you can't back out of your job. What is your view regarding Naraka (deepest layer of "Buddhist Hell")? Note: souls that aren't sent to Naraka don't necessarily end up in Bhavaagra (Enlightened paradise). 1. Never send a single soul to Naraka. 2. Only send them there if there's something that you cannot possibly overlook. 3. Write up or memorize a list of criteria beforehand so you don't have to sweat the details later on. 4. Actively look for reasons to send them there, to serve as an example for all the sinners out there. 5. Mull over each decision with despair, with a coin to flip when needed. My closest match is Yuyuko Saigyouji while runner-up is Byakuren Hijiri. The former was unexpected, Youmu would fit me more in my opinion, the latter I don't know, I'm still not familiar with her; but I smiled while reading the comments because much of them are close to what perceive I am. I got Kokoro with Sanae as a runner-up. Yeah... makes sense with those descriptions. As suggested, I made a more comprehensive results page, which now shows how you measure up against the personality categories, as well as a label for the characters you land. Okay. I went from Reisen/Mokou to Reisen/Meiling. Changed up my answers a little bit in an attempt to suit my actual thoughts/behavior better and got Reisen Udongein Inaba with Suika Ibuki as my runner-up. A little odd since I can get pretty emotional about a fairly long list of things - not that fitting for an emotionally balanced/stable/carefree character. Maybe I answered some of the questions wrong. And here I went the other way. Then again I don't really keep track of my answers and just answer whatever fits me best at the time (probably says something about me, but eh). I got Reisen and follow up was Satori. Well... Okay? That was weird. Entretaining quiz though. Not much is known about Satori's actual personality. 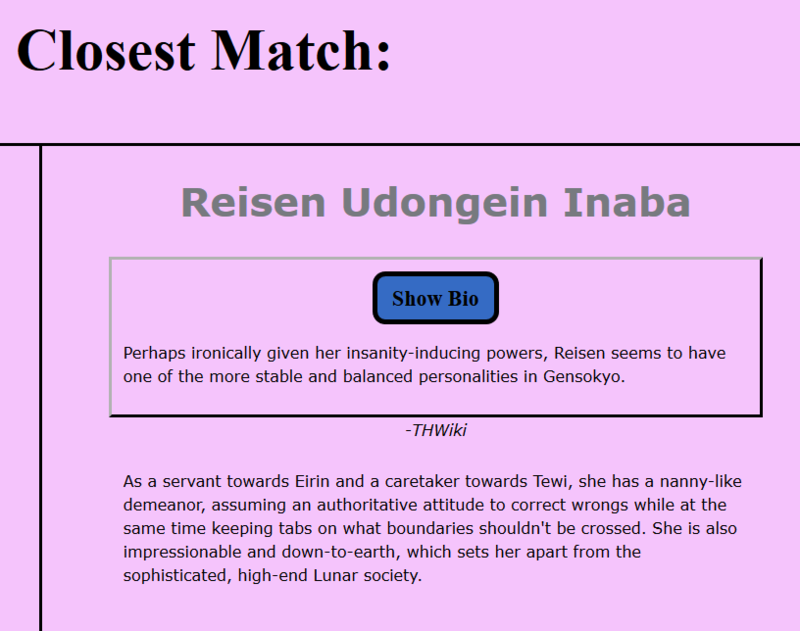 Actually after thinking about it a little bit, I can kinda see why I got Reisen and Satori with their descriptions... I say Alice would fit better for me though, but I can kinda understand why I got this. I was doubting that i should answer these by myself, got Marisa as closest match, which i think the "THWIKI" are just not exactly me. I mean, i ain't gonna waltz into SDM without some live goat or chickin at least. The next part at Marisa thou, kind of a yes i think. The runner-up though, Bakari Yakumon, kinda offend me (lolol), never a speck of my life i've been someone like that (lolol). I gotta admit, I'm still completely confused by the third question. Specifically, its choice of answers. As in I literally don't get it. Realizing none of this is supposed to be taken seriously, most of the questions and their answers had some kind of reasoning behind them that was immediately obvious. The third one still bugs me. Is it just thrown in there as a place-filler or for obfuscation? Please elucidate. So guess what I learned today. I might not the best judge of character after all. I'm curious though, what's more offsetting for you guys? Your personal results (as in "You are..." segment) or the values assigned to the matched characters? (e.g. Reisen is OHISU, and both Marisa and Yukari are SHKSH). If there's something about the way I assigned the values to the characters that need to be changed, please do tell. Satori's a tough one. She doesn't have many appearances in the official games compared to the other characters, and the reason I included her was because she was in the top ten most popular according to some poll. Apparently, people like her for a reason? I just went with the flow. IK here refers to the innocent-vs-knowledgeable spectrum, and the 1.5 was meant to skew the average towards a lower value in a scale of 1-4. Doesn't mean the taker is stupid, mind you! It means the person might not in tune with the culture surrounding him/her. And understanding the culture and social norms (but not necessarily agreeing with them) would play a part in determining if a person is "innocent" or "knowledgeable." The second answer wouldn't reveal much in this regard since the person might range anywhere from the middle and upwards, so I just gave no points in any metric. Not gonna say this was the best way to gauge this particular aspect, but I wanted to have something. Sorry for the confusion. OK, that makes more sense upon clarification. Thanks, it's neat seeing how the scoring is done behind the scenes. Here's my profile of Youmu in case you wanna compare/contrast. 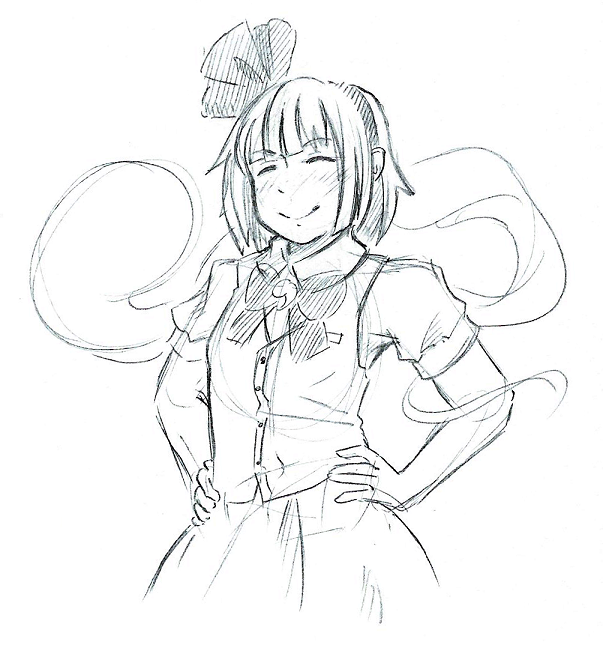 Bio: Youmu is a half-human half-phantom who lives at Hakugyokurou in the Netherworld as a gardener and fencing instructor, who also serves for Yuyuko. Wiki: As she has a straightforward diligent personality, she is often manipulated by those around her (especially Yuyuko). Notes: She's mission-oriented and strikes at enemies without hesitation. She's not exactly the most quick-witted and gets confused easily. Even though she's a loyal servant, she won't hesitate to snap back at her mistress Yuyuko if she's being nonsensical. But that might just be a desperate bid for her own sanity. Bio: Alice is a doll-controlling magician who lives in her home in the Forest of Magic near the home of Marisa. Wiki: Maybe since she was originally a human, even as a youkai, she has high understanding and friendship level to humans, and if someone gets lost in the Forest of Magic, she also gladly gives shelter upon arriving at her house. She's an indoors type who was often alone. Notes: She's self-absorbed and has a low tolerance for nonsense, and thus can be a bit of a diva. She's credited as being level-headed, but that's probably because she makes a great foil for her friend Marisa. The "you are" part are pretty accurate, it's fine. There's probably also mistake on my input too. like i said, it's probably better for the closest person to me to answer these for me, for reason so there no unconsciously inputting choice to be your "ideal aim". But your closest person can be delusional too LMAO. I am indeed see myself as carefree as Marisa or Yukari, but not as easy going and frank as Marisa. I also do not lie on serious & important matter whatever the outcome will be, but i tend to be manipulative. I also do not intrude a vampire lair or any other household especially when i know it's a cannibal one without a convincing reason for myself. I think Marisa doesn't quite match with "More Isolationist than Intervening" ? I mean, she always tagging along in the Hakurei business? I can relate to the "Yukari" except i'm rather discriminative to who my victim are. And maybe also not as knowledgeable. But i think Yukari is just fine in there. It's just kinda right, but not exactly. Don't take me strongly tho, im not best at this. Watch out for my my Special Attack MOVE! Reisen Udingdong Inaba. Runner up Marisa. lol why did I even take this quiz? Upon thinking about it, I realize that I really do relate to Byakuren, a lot. I was given Marisa #1 and Satori runner up. 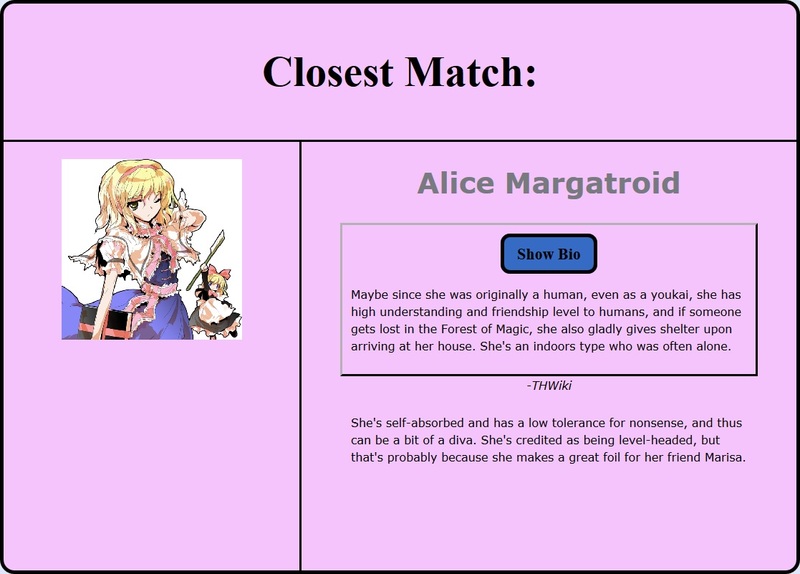 Pretty good result, I think, although I'm not so sure about Marisa being "Isolationist". I got Mamizou as my choice with Suwako as my runner-up. Makes some sense but I am not sure whether I should be happy or worried I am compared to those two according to this.